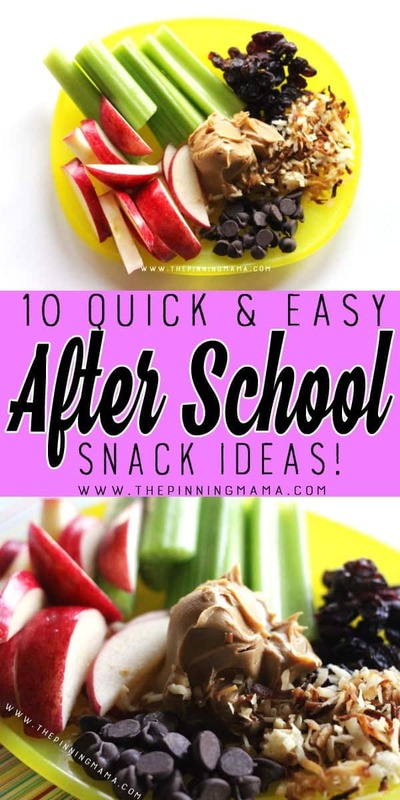 When the school day is over and the kids are starving, these 10 After School Snacks are quick and easy to make and are filled with things they will love to eat! 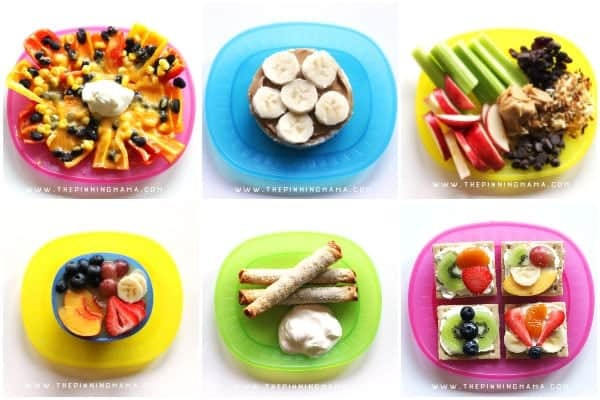 From fruit pizzas to heartier snacks like taquitos or mini pizzas made quickly on a rice cake, there is a unique and filling snack for every appetite that you can have prepped and ready in just minutes! It seems like every day after school is the same story. The kids come through the door and act as if they have never been fed in their lives and if they don’t get a snack that instant, that they just might not make it. It is terribly dramatic and they have mastered the act perfectly. 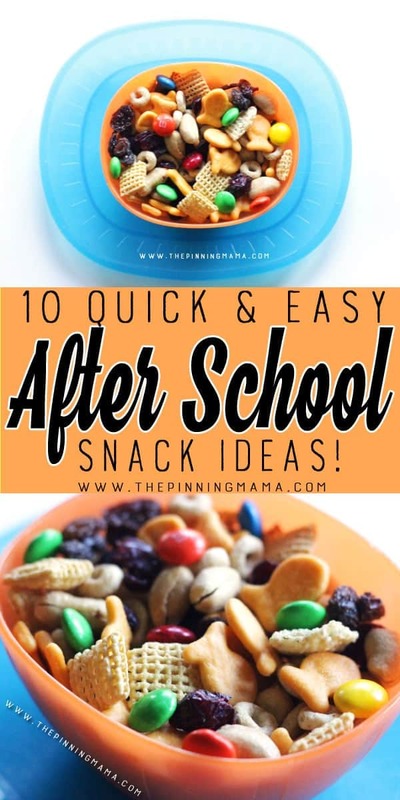 So naturally as chief mom in charge of after school snacks I have had to come up with several options that are quick, easy, and kid approved so that no one wastes away after school in my house! Each day we do snacks differently. For example, if we are going to soccer practice I need to give them something much heartier to get them through practice all the way to dinner. If it is a day where we are going to eat dinner as a family in just a couple of hours, however, I want the snack to be much lighter so they are still hungry when we set dinner in front of them and not filled up on snacks. When they aren’t hungry, they seem to be 100x picker and aren’t as willing to sit still as long at the table. Hungry kids just make for much better dinner companions! 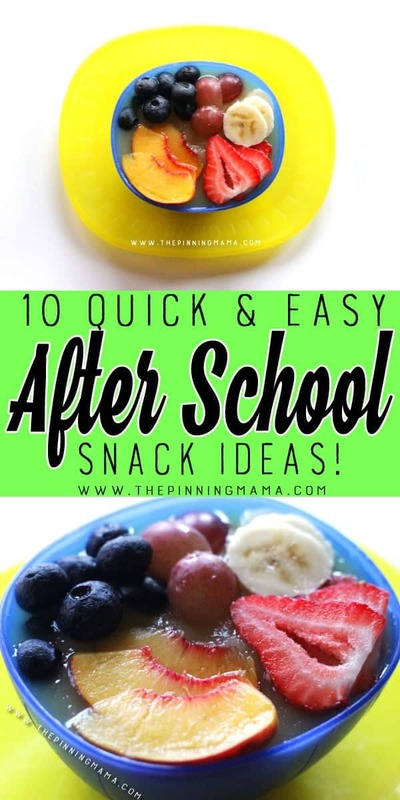 So from light to hearty, here is a list of quick and easy after school snack ideas I keep ready to go! My kids love these and I do too! They are super easy to whip together with just graham crackers, cream cheese, and whatever fresh or canned fruit you have on hand. Just spread a thin layer of the cream cheese on each graham cracker then arrange your fruit on top. In the warmer months we have lots of fresh fruit and use strawberries, raspberries, blueberries, kiwi, peaches, pineapple, and other delicious seasonal fruits. In the winter months bananas, apples, oranges, and canned fruits work well. 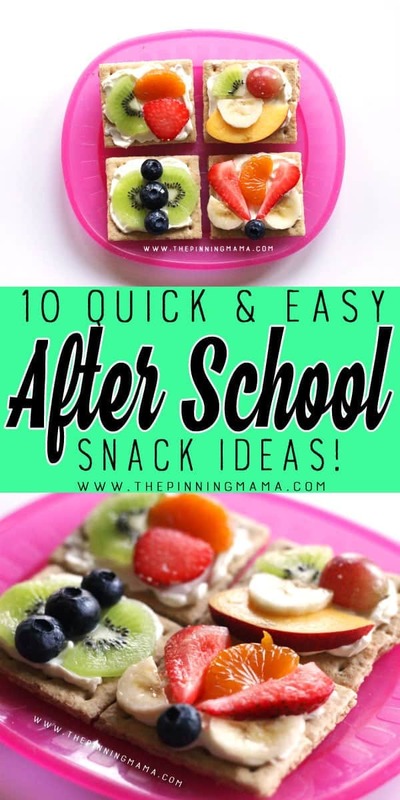 The extra bonus with this snack is that if you have the time, you can chop up the fruit and let the kids make their own masterpiece snack which serves as a creative activity too! Oh goodness, these had to make the list because they are my kids favorite and they ask for them daily! These are extra crunchy chicken taquitos from El Monterey and I love them for so many reasons! First and foremost because they are loaded with delicious wholesome REAL ingredients like chicken, cheese, and flour tortillas. They are packed with flavor and come in a few different options. Also, they can be microwaved and on the table in minutes, or, if you have a little extra time, you can bake them in the oven to make them extra crispy. Serve them up with sour cream, ranch dressing, or guacamole to get some extra healthy veggies in there! 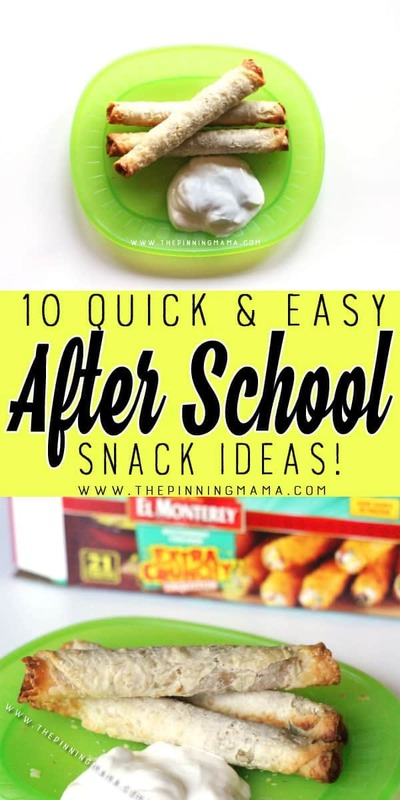 As a bonus these are great for kids on the go because they are self contained so if the kiddos are running out the door you can make these up and they can grab and go! It is one of my favorite filling and hearty options when the kids need something that will get them through practices or hold them over to a later dinner. Our favorites are theChicken & Cheese Frozen Taquito Snacks and the Extra Crunchy Chicken & Cheese Taquito Snacks which have an extra crunch and a seasoned shell. They also have many other options like beef, nacho cheese, chimichangas and mini chimis, and both flour and corn tortilla options. Growing up in Texas I really, really love my Mexican food, so I appreciate that El Monterey taquitos are inspired by authentic Ruiz family recipes, with a rich Mexican heritage and the bold flavors of Mexican cuisine. This one is one of our favorite pre-sports snacks because it is packed with protein and the right kind of carbs to build up their energy! These peanut butter & banana rice cakes are so simple to make. I use a lightly salted rice cake and add a layer of peanut butter on top. Then add a few banana slices and you are ready to go. 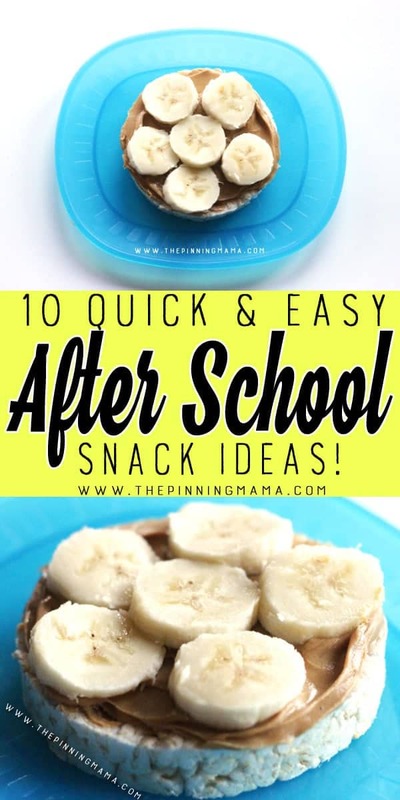 If your kiddos are super hungry they might eat two or even three of these which is perfect because you will use up the whole banana! This little snack is great anytime and sometimes even makes an appearance in our lunch boxes too! 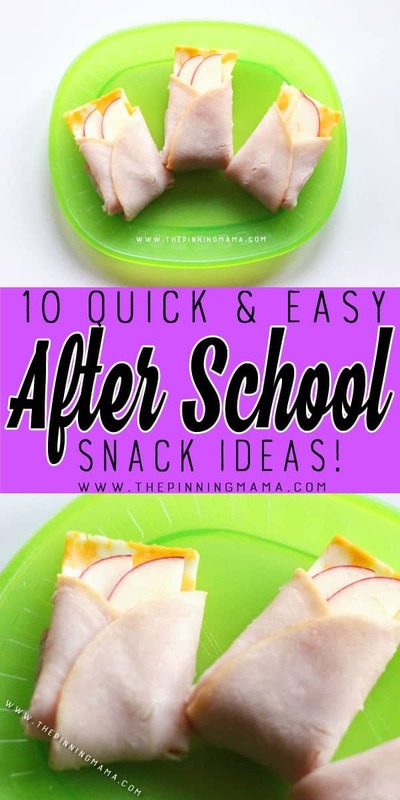 I use round, thick cut lunch meat and lay half a slice of cheese in the middle then layer a couple of thinly cut apple slices on top. Fold the two sides in around the cheese and apples, then fold the bottom underneath to create the pockets. I love that this snack is healthy, easy to put together and contains ingredients we almost always have on hand. 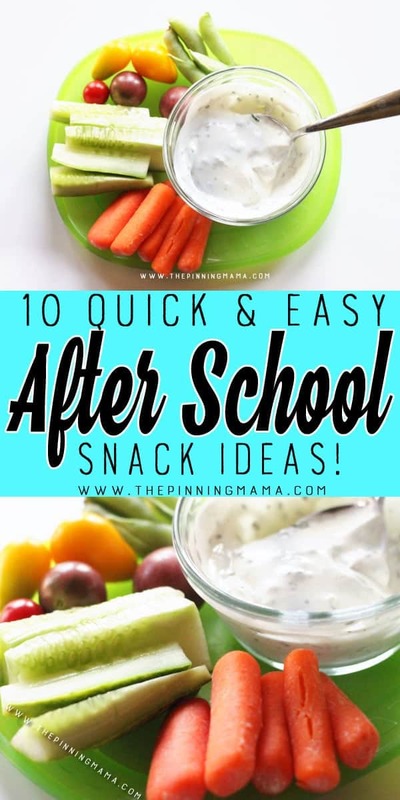 If I know anything about children, it is that they like to dip things, and they will almost assuredly eat anything covered in ranch, so naturally this after school snack is always a hit in our home. The other big bonus with this one is that you can easily scale it without adding much time for prep if your kids have friends over or just end up extra hungry that day. To make this you can use ranch straight from the fridge, or mix up some powdered ranch with Greek yogurt or sour cream to make it a little thicker for dipping, which is what I usually do! I think this snack is the best of both worlds! Kids love it because well… it’s nachos! And I love it as a parent because even though it has some ooey-gooey cheese, it is loaded with veggies so it is really a very wholesome snack. To make these I use mini peppers. They are perfect because of both the size, and because you heat them just enough to melt the cheese but not enough to cook the peppers, so they retain their crunch just like a classic nacho would have. First wash the peppers, chop the tops off and slice them in half. Remove any seeds that are inside and lay them inside facing up on a microwavable plate. Then layer them with corn, black beans, and anything else you like on your nachos, and top them with a handful of cheese. Microwave them, 30 seconds then an additional 15-45 seconds in 15 second increments until the cheese is just melted. Add sour cream, Greek yogurt ranch, salsa or guacamole on top and let your kids dig in! My oldest really, really loves peanut butter so we incorporate it into snack ideas at our house. If you are peanut sensitive you could do the same thing with almond butter or even Nutella. I just load up a plate with celery and apples, but you could also add graham cracker sticks or other things that go well with peanut butter for dippers. Then I add a nice dollop of peanut butter in the middle and add a few extras on the sides like toasted coconut, chocolate chips and dried fruit or raisins. Then the kids dip the dippers into the peanut butter and then into one or more of the toppings to make a really delicious treat! When the fridge is a little empty and I’m stretching the trips to the store a few more days than I should, I can almost always throw together a snack mix for the kids to eat after school. The basic formula is just a couple of handfuls of cereal, you can use multiple kinds if you have them, add in a handful of bite sized crackers, any nuts you like, some dried fruit or raisins and then a few chocolate candies or chocolate chips to make it fun. I love how easy this is, and also love that I can throw it in a baggie making it a perfect snack on-the-go. 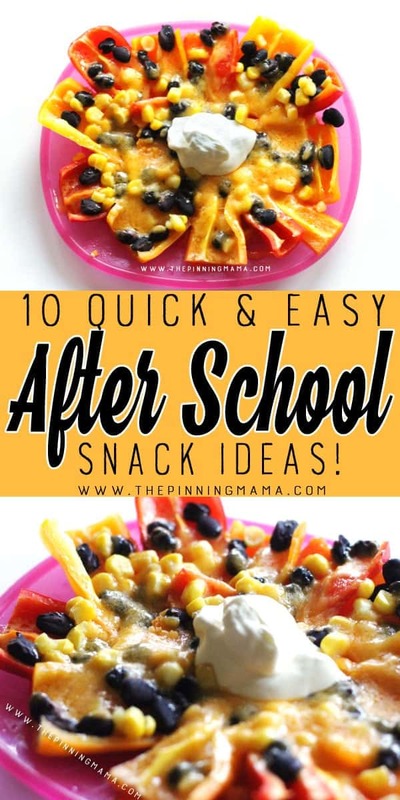 Well those 10 after school snack ideas will get you through 2 whole weeks of school days with no repeats, or if your kids are like mine and get a favorite, let them wear it out and then move on to the next thing! The beauty of it all is that everything on this list is so super quick and easy, it is a win-win for parents and kids! 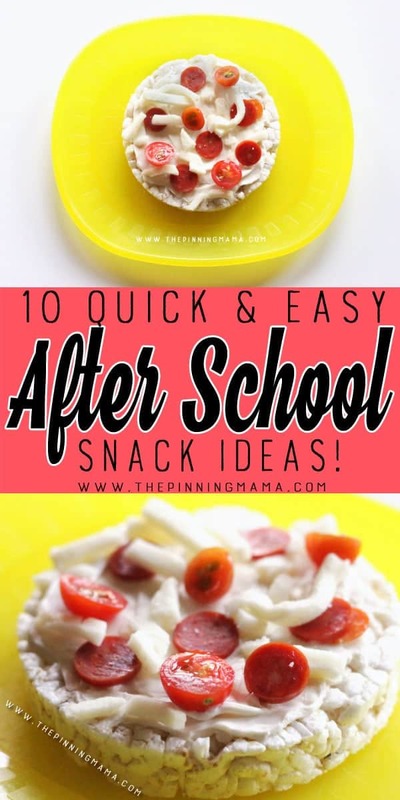 Do your kids have a favorite quick and easy after school snack idea? I would love to hear in the comments below!